Rallye Auto Charlevoix from 1987 to 1999. 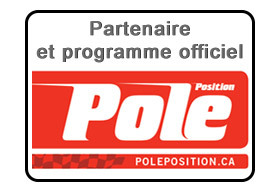 Rallye International de Charlevoix from 2000 to 2002. Rallye de Charlevoix since 2009. Estern Canadian Rally Championship event since 2016. Quebec Rally Championshiop from 1987 to 1989, from 2009 to 2015 and since 2017. North American Rally Cup and Canadian Rally Championship from 1990 to 2002 and since 2019. Under observation for the FIA World Rally Championship in 2000 and 2001.